Many ground level or elevated water storage systems use what is known as an Altitude Valve. 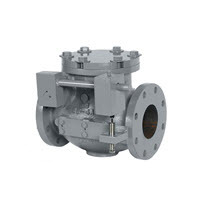 These valves close at a preset high-level to prevent overflow of water in a ground storage tank or reservoir, opening to refill the water in the tank or reservoir as the level lowers. In crude systems they are reliable and effective. Modern water storage requirements are not usually well served by such stand-alone devices though. For fire protection, a much more effective, less temperamental and less expensive solution is an electronically operated system that connects to automated building management systems, has alarms, or even redundant switching and alarms. A better solution for Fire Safety holding tank systems, and a replacement for them, is the Waterline Controls WLC FPT-50. This Fire Service Water Tank Level Control with high and low alarms gives you modern, state of the art control, visible and audible alarms, and peace of mind. Elevated Reservoirs that use Altitude Valves can benefit from our SWS5000 Control System. 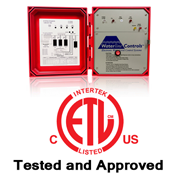 Our systems come with a modern, intrinsically safe, electronic sensors. Our systems connects to a BAS or building management system for many modern code requirements, or just logical safety precautions.